We're proud of our dedicated commitment to education and leadership in Nepal. Leadership Team, Learning House - Running an education center is no easy task, but this group is up for the challenge. Dedicated volunteers, hard working students and local professionals all come together to make sure Learning House runs smoothly. Visit www.learninghousenepal.com to learn more. Ngawang, Executive Director - From his beginnings as a teacher training recipient to his rise as manager and overseer of Learning House, Ngawang is on the ground working hard to build a positive learning community in Pokhara. Always with a smile, he teaches students and works alongside collaborators with grace and respect. Soni, Student Advisor - With years advising and assisting students, Soni brings helpful knowledge and guidance to the team at Learning House. She counsels students and educates visitors on options of local employment and higher education abroad. Her brightness, hard work, and patience is a great asset to the team. 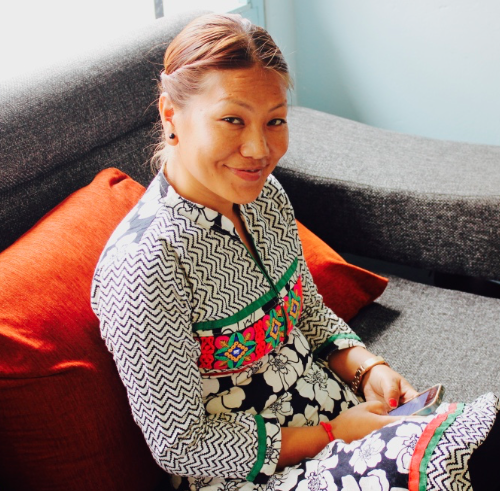 Michelle, Founder and CEO - A social worker and entrepreneur committed to the people of Nepal, Michelle's heart and passion is the pulse of Khata Life. Tweet her @redheadlefthand. Laura, Secretary and Board Member - With decades served in government and education sectors, Laura's perspective on youth issues and program development is practical and decisive. Carole, Board Member - Carole's long career in creative education lends a brilliant light to curriculum expansion and student issues. Helping us develop educators and students, Carole's devotion to lifelong learning is a huge asset to our team. Craig, Treasurer and Board Member - A seasoned executive with a heart for giving, Craig's insight into business development and marketing strategy helps us grow initiatives thoughtfully and efficiently. His passion for tech guides some of the more advanced educational offerings at Learning House. Doug, Marketing and Expansion - Doug's on-the-ground experience in Nepal has given him unique perspective into the work and obstacles we face on a daily basis. His combined expertise in tech and branding and commitment to personal development is an incredible resource for students and teachers alike. Evelyn, Education and Social Work - Evelyn's years working with youth and community is an invaluable asset. A Licensed Clinical Social Worker and experienced educator, her extensive insight into systems and community programs helps us thoughtfully target problems and get individuals the help they need to succeed. Rainer, Strategy and Sustainability - Social development and enterprise have always been Rainer's passion. With a focus on serving communities and empowering individuals, Rainer takes on projects that help make a difference. Rainer serves as mentor to non-profits, providing technical reports and fundraising help to community-centered initiatives. He helps Learning House think carefully through decisions that benefit students and brings sharp observations and hard questions to Khata Life. A huge THANK YOU to our behind-the-scenes group of GENEROUS individuals.